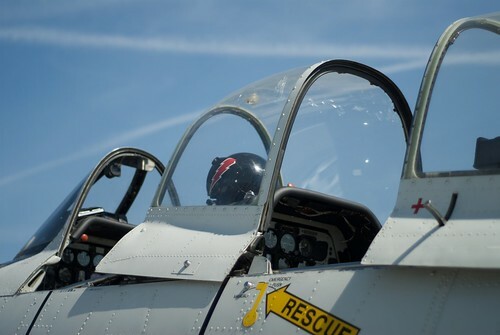 T-28 Trojan Cockpit, originally uploaded by pmarkham. The T-28 is a single engine advanced trainer that was designed to replace the aging T-6 Texan. It was used primarily in the 1950s and 1960s, but it wasn't completely retired in the US military until the early 1980s. This example is a T-28C, as it is equipped with a tailhook for carrier landings. I have photos of the hook in other photos.